On a ranch, our sole lifeline is water. Water nourishes, hydrates, and replenishes. Without, life would cease to exist. And the smart Rancher knows they must plan for proper watering during each season. Pumping and transporting water to remote areas of your ranch helps not only your thirsty cattle, but yourself as well. 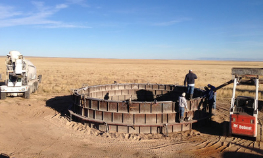 Ranch Water Inc. specializes in water improvement projects specifically for watering livestock. 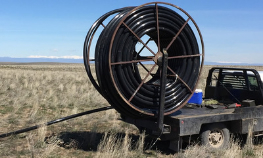 By piping water to new areas on your ranch, you can dramatically improve your range. We simplify Livestock Watering on your land. 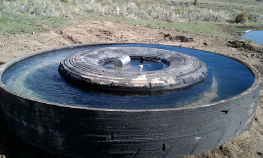 With HDPE fusion pipe, giant tire water troughs, huge concrete storage tanks, and solar water pumping, we can help you improve your ranch. We understand not all ranchers raise sheep and cattle. If improving wildlife is important to you, then water is important to your wildlife. Water is the lifeline for all wildlife and we can improve your water systems. We know you want to provide a safe and reliable supply of good quality water for your livestock. Ranch Water can increase your water management to better utilize your pastures for livestock production. Ranch Water offers a variety of watering solutions for your remote watering needs. Our services provide ideal remote watering systems for your pasture and livestock during all seasons. Select below any of our services and feel free to contact us for more information. We happily provide Consulting Services as well. High-Density Polyethylene Fusion Pipe Systems are ran for optimal performance for agricultural and livestock water transfer. ​Pipelines allow livestock producers to better utilize their water source. Ice proof, bullet proof, and tractor proof, our tire insulated stock tanks are cost effective and approved by the ​United States Department of Agriculture's Natural Resource Conservation Service. Solar-powered systems are popular because of their reliability and low maintenance. Solar panels collect and convert sunshine into electrical energy, which can be used to pump water. Water storage tanks or reservoirs provide the necessary livestock water between pumping cycles. Most are raised above the stock tank to allow for the gravity flow of water. 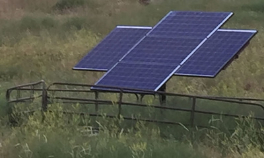 Ranch Water provides well planned and constructed pasture water systems for livestock, solar power options to move water, high-quality tire troughs, and water storage solutions. regardless of the size of your ranch. Watering has never been easier and is now more efficient that ever! We would love to hear from you! Call or send us a message and we can discuss ways to equip your land with Remote Pasture Water Systems for your Livestock. Copyright 2017. Ranch Water Inc. All Rights Reserved.